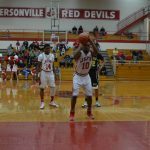 Tuesday, February 24, 2015 7:30 PM Jeffersonville High School AWAY 63 Charlestown High School HOME 44 Game Recap Jeff took the lead early did not look back as they cruised to a 19 point win over the Pirates. Jeff was lead in scoring by Chad Hudson with 22 points and Anthony Southers with 12 points. 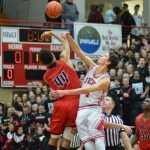 Friday February 6th, 2015 08:00 PM Francis Joseph Reitz High School Away 124 @ Jeffersonville High School Home 67 Game Recap #1 Evansville Reitz continued their winning streak Friday night as the beat the host Red Devils 124-67. The hot shooting Panthers took the lead early and never looked back as they cruised to victory. Saturday January 24th, 2015 07:30 PM Jeffersonville High School Away 50 @ Columbus East High School Home 42 Game Recap Jeff got their first conference road win of the season by defeated the Olympians 50-42. Jeff was led by Ronnie Todd with 13 points, Chad Hudson with 12 points, and Demarre Sims with 8 points.